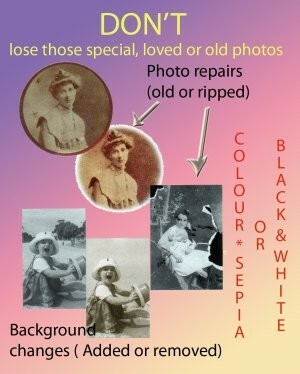 do not let those old photos deteriorate or peel or even rip further....let us bring them back to life. water damaged, fire damaged...there is always something we can do. Our other specialties are photo manipulation...changing backgrounds, removing objects, adding objects or people, creating a photographic collage or photographic family tress....your request is our challenge.